Product prices and availability are accurate as of 2019-04-16 01:14:27 BST and are subject to change. Any price and availability information displayed on http://www.amazon.co.uk/ at the time of purchase will apply to the purchase of this product. 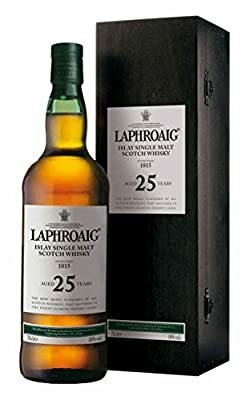 Bottled at 40% ABV, it is a perfect fusion of these two most different styles of maturation flavours, made even smoother by the 25 years it has had gently maturing. COLOUR - Bright Red Gold NOSE - At bottling strength the aroma seems quite closed giving only a rich, sweet scent but a touch of water releases all the multitude of different flavours. The initial sweet, sherry sweetness is quickly followed but the time-honoured Islay peat tang. After this opening burst of flavour there is a smooth fruit ripeness that complements the tang of salt in the background.